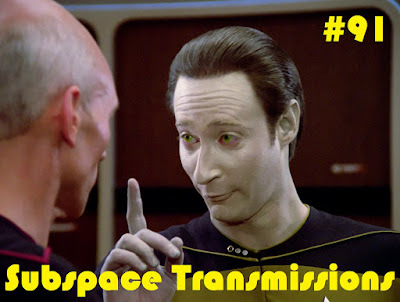 Subspace Transmissions: A Star Trek Podcast: #91 - EARLY TNG: WHAT WENT WRONG? Ask most Trek fans what their favorite series is and they'll likely namecheck The Next Generation. But, as brilliant and popular as that show was, how many will cop to loving its first two rocky seasons? Using William Shatner's recent Chaos on the Bridge documentary as a launch pad, this week sees hosts Cam Smith and Tyler Orton taking a critical look at the series' early days in an attempt to underline what exactly went wrong, and whether glimmers of actual greatness emerged from the behind the scenes insanity. From notorious episodes such as Code of Honor and Justice, to the triumph of Measure of a Man, the duo take a fearless trip down an often maddening rabbit hole in search of meaning, answers and maybe, just maybe, a hint of redemption. Wanna appear on the show? Shoot us a 30 to 60-second audio clip telling us WHAT WENT WRONG WITH EARLY TNG and you could take the spotlight in an upcoming program! You can also send any other questions, topic ideas or feedback to subspacetransmissionspod@gmail.com! Join us next week as we discuss the latest trailers for STAR TREK 2017 and BEYOND!